"I can always do it tomorrow!" Are you caught in the tomorrow trap? 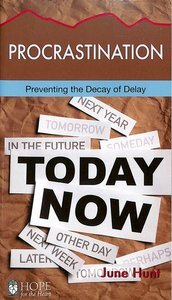 Have you noticed how the decay of delay has affected various areas of your life? If allowed to continue, the pursuit of the trivial will preoccupy your attention and paralyze your progress. If you are plagued with procrastination, with God's help you can rearrange your priorities and complete your tasks on time. Productivity can replace your tendency toward procrastination when guided by the biblical principles of good time management. Be assured, you can defeat procrastination, finish tasks on time, and enjoy the process. About "Procrastination (Hope For The Heart Series)"
You've heard plenty about getting hooked on drugs or alcohol or sitting at slot machines from sunup to sundown, but can you really become addicted to a person? The answer is yes - codependency is a relationship addiction. A codependent is anyone who is dependent on another person to the point of being controlled or manipulated by that person. Learn how to be released from relationship addiction and have a renewed commitment to put Christ first.